Eternal Orthodox Church calendar for the 22.04 year 2019. He was of gentle birth and was reared in faith and devotion. 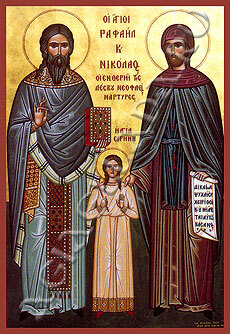 In the time of the Emperor Julian the Apostate, when St Basil the Great was governing the Church in Caesarea, Eupsychius married a girl of good family. But he was not given even one day to live in wedlock, for, on his wedding day itself, there was a pagan festival with sacrifices to the idol of Fortune. Eupsychius went out with some others and smashed all the idols in the temple, then pulled down the temple itself. Julian was furious, and commanded that the culprits be beheaded, that many Christians be taken into the army, that an enormous levy be imposed on Christians, the proceeds of which were to be used to rebuild the Temple of Fortune, and that the town cease to be called Caesarea (as it had been named by Claudius Caesar), and revert to its former name, Maza. 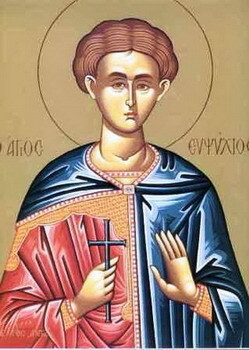 Eupsychius was first bound to a tree and cruelly tortured, and then beheaded, in 362. A little after this time, the wicked Emperor Julian visited that town on his way to Persia, against which he was waging war. St Basil went to meet him, bearing three barley loaves as a sign-of honour and welcome. The Emperor ordered that, as a return gift, the saint be given a fistful of hay. Basil said to the Emperor: 'You ridicule us now, O King; we bring you bread, by which we are fed, and you give us miserable food which you, with all your power, are not able to turn into nourishment for men!' To this the Emperor replied: 'You can be sure that I will feed you with this hay when I return from Persia!' But the wicked apostate did not return alive from Persia, but perished there by a fitting and unnatural death. In the time of the Persian King Sapor, Vadim, abbot of a monastery and a man famed for his grace, was thrown into prison with seven of his disciples. With him in prison was a Prince Nirsan, also a Christian. Every day they were taken out and flogged. Prince Nirsan was afraid, and promised to forsake his faith and worship the sun. This was pleasing Sapor, and he promised Nirsan all the possessions of Vadim's monastery if he would, with his own hands, behead Vadim. Nirsan agreed to this. With trembling hands, terrified by the dignity of St Vadim's face, he let the sword fall several times on the holy man's neck , hardly succeeding in beheading him. But, very quickly after that, he fell into despair and ran himself through with his own sword; thus receiving at his own hands the punishment for slaying a righteous man. 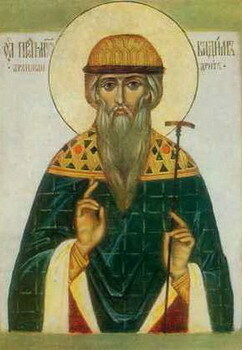 St Vadim suffered in 376. 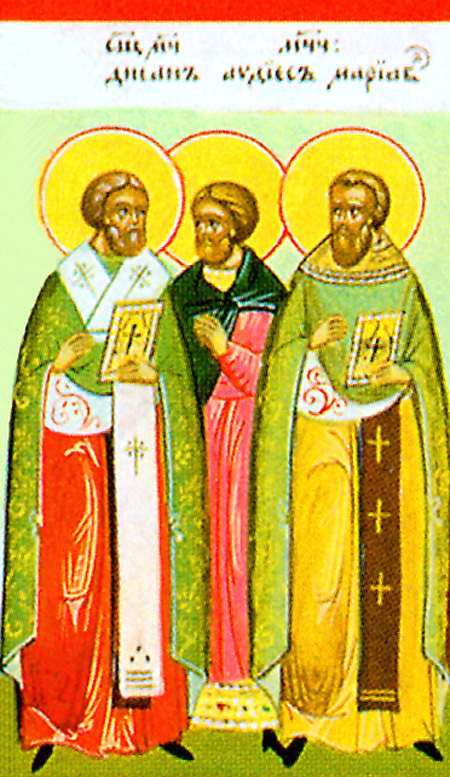 The Holy Martyrs Bishop Dysan, Presbyter Maryab, Habdies and 270 Others accepted a martyr's death (+ c. 362-364) under the Persian emperor Sapor II. Imprisoned, they refused to recant the Christian faith. In their number also was the Martyress Iya, who is commemorated also on 11 September.